Fixture uses 4" fitter shades. Shades are sold separately. We picture 073G as a suggestion. 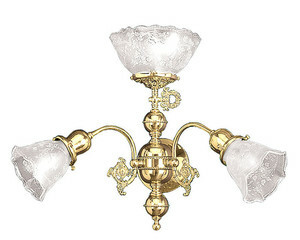 Dress up this fixture by using fancy shades such as our hand-cut glass shades 0245G . 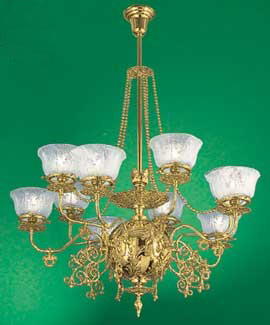 pictured here also are a few charming additions to a room holding this chandelier. 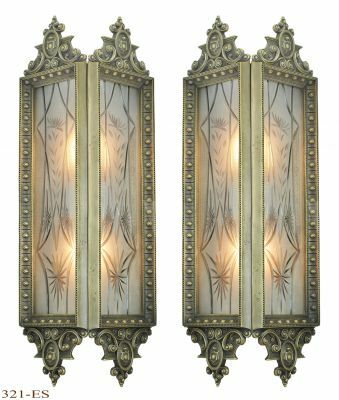 Look for the spin-cast brass ball on sconces such as 606-TRP-SA , and 604-DAE-ES . Tie into the beautiful pierced brass detail on the canopy and fitters by using newel post light 299-FGE-NW . By 1890 electricity was being phased in, so the transitional sconce and newel post are appropriate to the period. 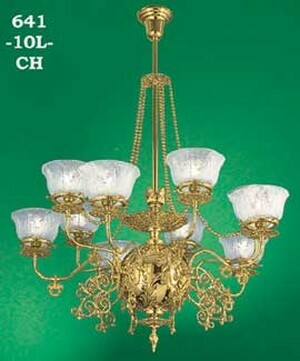 Fixture is 46" tall, but can be shortened to 28". Spread: 39". For shortening, note that the disk that holds the chains at the stem is adjustable up and down with a set screw making shortening easy. Although the 10 sockets rated for higher than 100 watts each, we recommend no more than a total of 1,000 watts, due to the heat. If using CF bulbs, a higher wattage output may be displayed.